I got to visit my grandparents for Christmas this year. My grandma is Italian. Needless to say my pants do not fit now. My grandma makes wonderful Italian food. 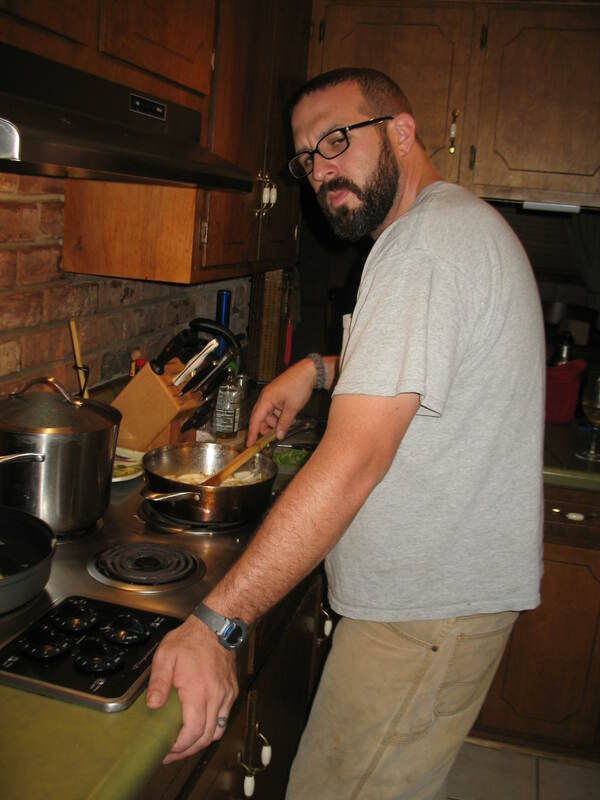 When we showed up there was a big pot of sausages and meatballs simmering on the stove. They’d been cooking all day. It was so good I think I ate half of it. This is my paleo version of it. 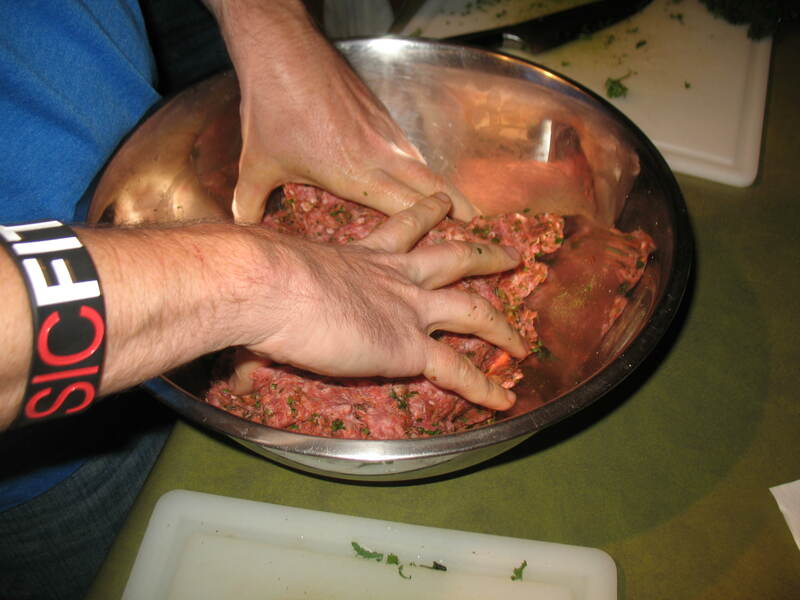 This recipe is not quick and requires a lot of hands on time. You could take a short cut and use premade sauce or meatballs, but then you’d be cheating yourself on the taste. 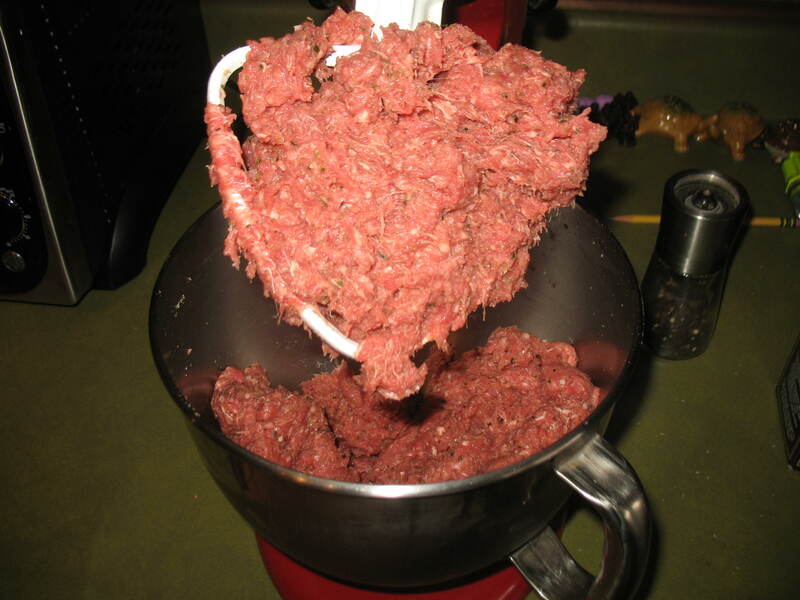 Mix meat and seasonings until combined. Roll out meatballs. I like a larger meatball so this made 22 for me. 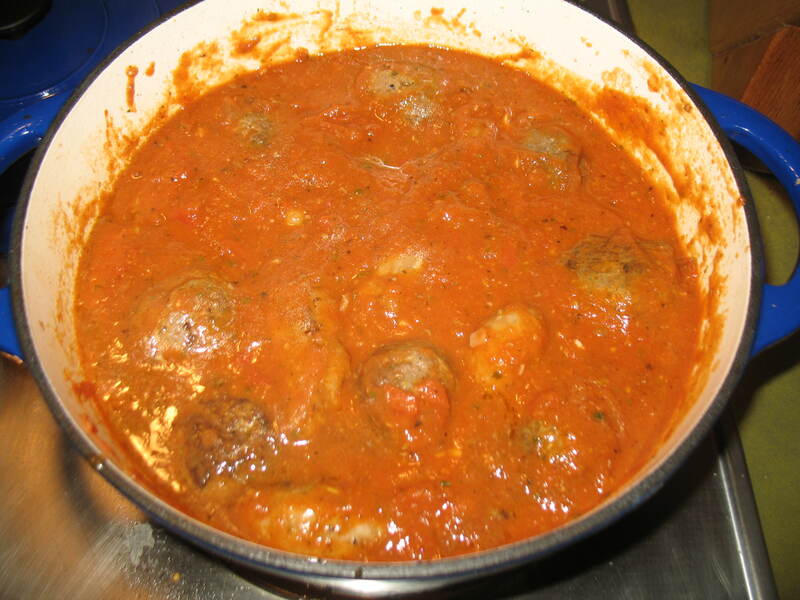 In a large stock pot brown all the meatballs in about 1 tbsp of olive oil. I used 10 store made (gluten free) sausages and cut them in half and browned them too. The meat is just browned not cooked through. 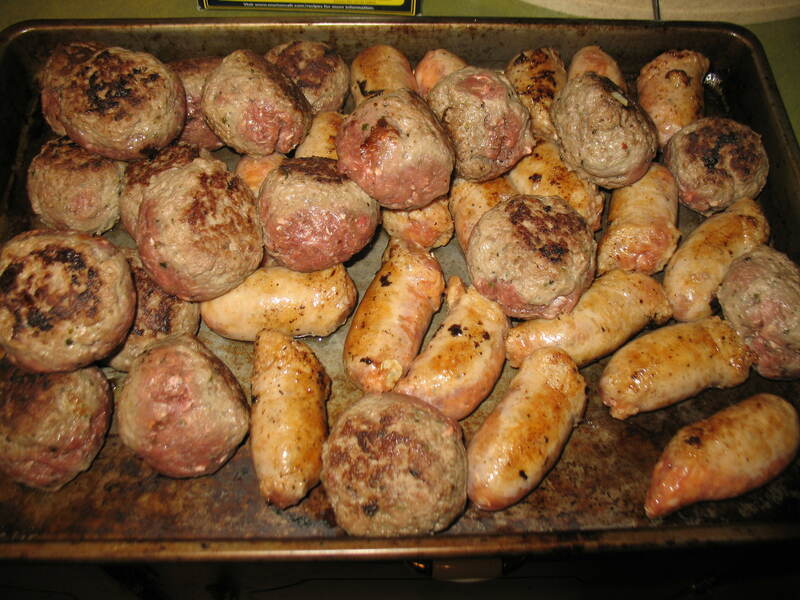 I had to freeze about 6 balls and 5 slices of sausage because they wouldn’t fit! Place them on a cookie sheet and put them in the oven on warm. I wasn’t trying to cook them just keep them from cooling off. That right there is the beginning of delicious! In the same pot you browed your meats add about 2 tbsp of olive oil and the onions. 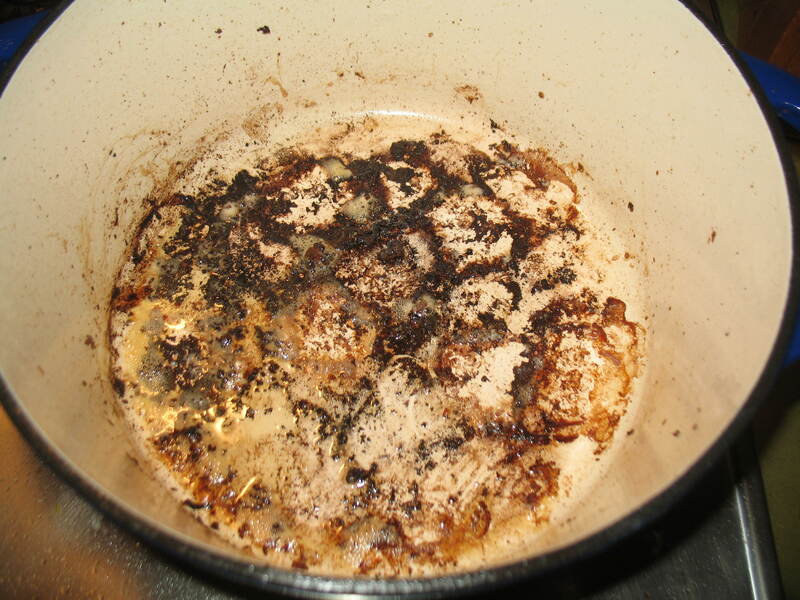 Cook on medium high for two minutes. At this point there should be lots of bits stuck to the bottom of your pot. 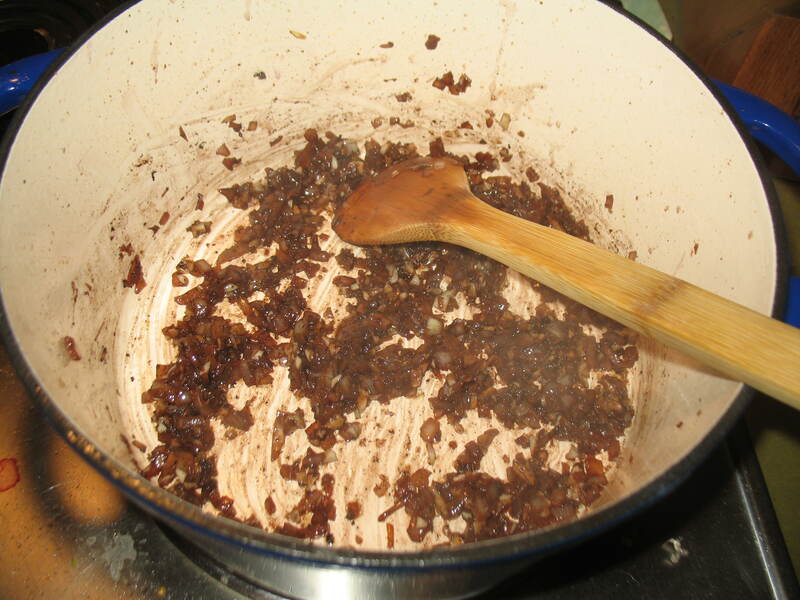 Add the wine in carefully and begin to scrape the bottom of the pot. If you have enamel pots like this one please use a wooden spoon to scrape so you don’t ruin the enamel. 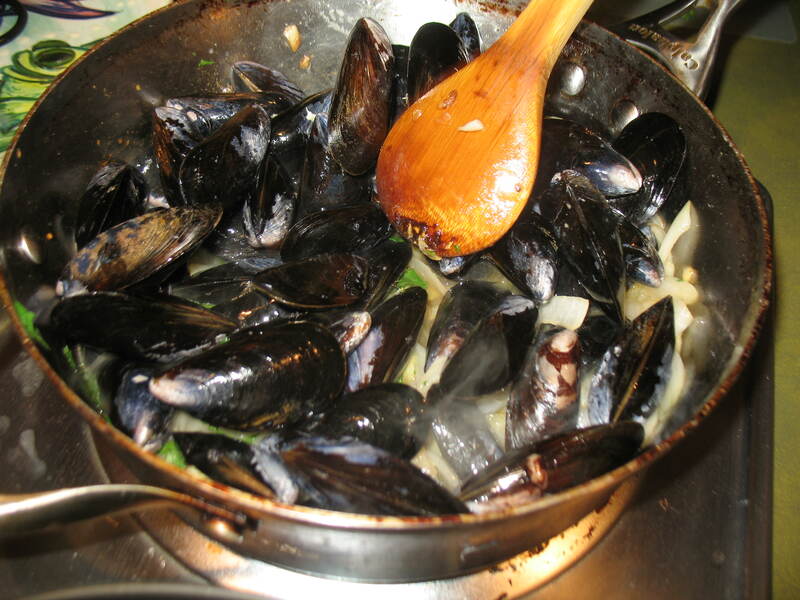 Continue to cook until the wine is almost all cooked off. This will take about 5 minutes. 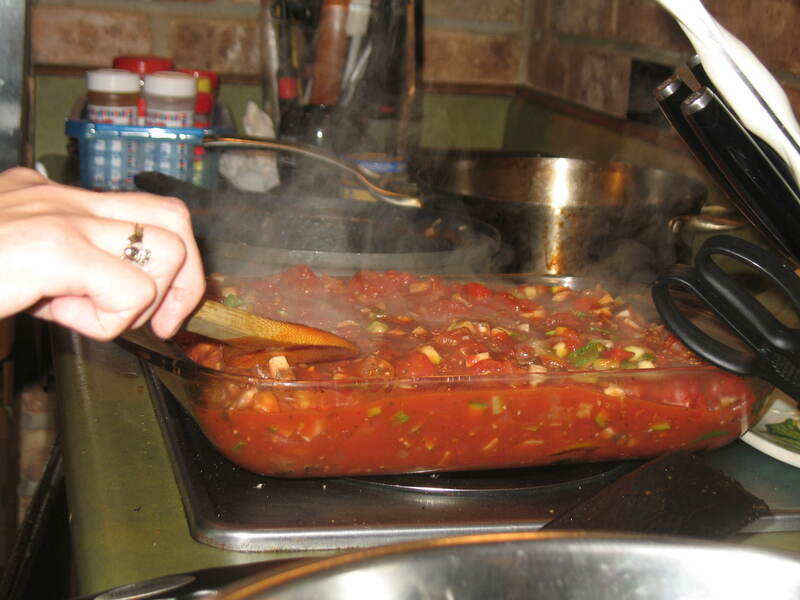 Add the remaining ingredients and cook covered on medium until the tomatoes are cooked down. This takes about an hour. You’ll know when it is done because it looks like tomato sauce. I removed half of the sauce and blended it smooth. If you prefer a chunkier sauce don’t blend. If you prefer a smoother sauce blend it all. Make sure to remove the center piece in the lid of your blender and cover with a towel. This keeps the sauce from exploding all over the counter. 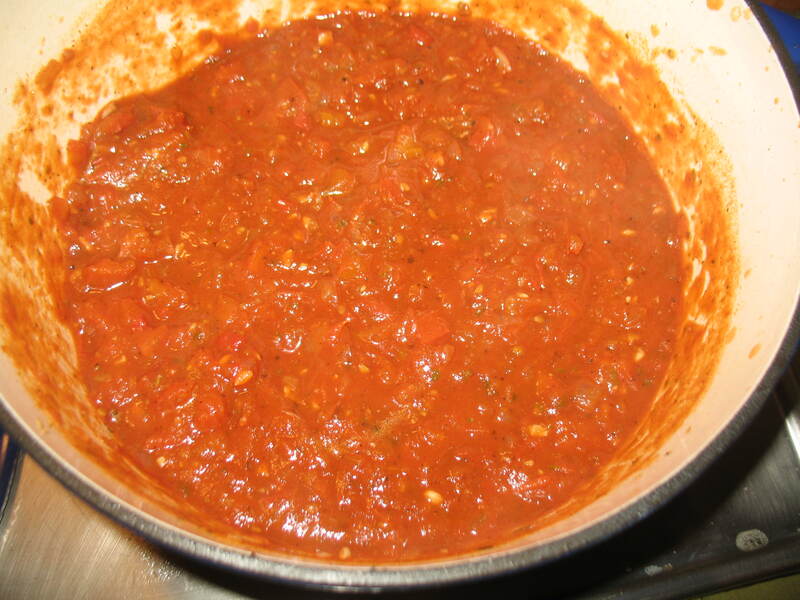 Add the blended sauce in with the unblended sauce, mix in the paste. Add back your meat and any juice that may have cooked out. Cover and cook on low for another two hours. We ate these just like this. 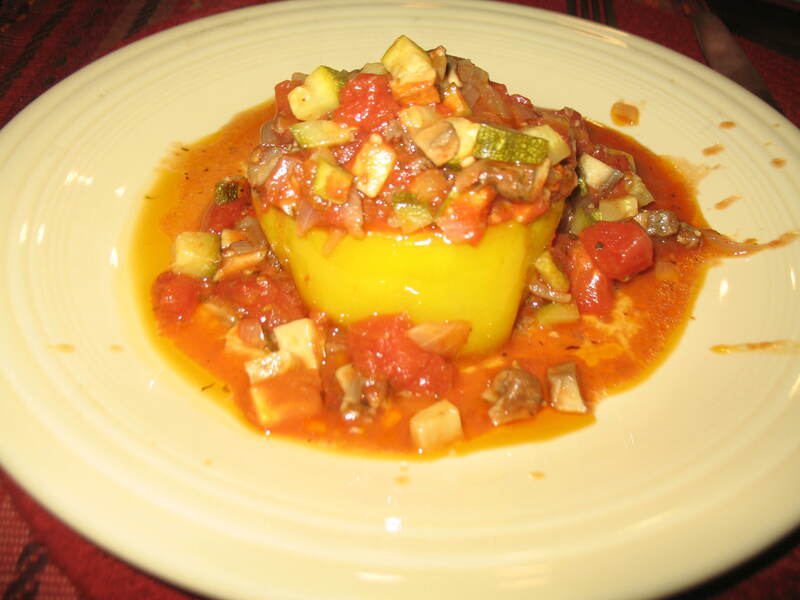 If you like, some spaghetti squash would be good too. 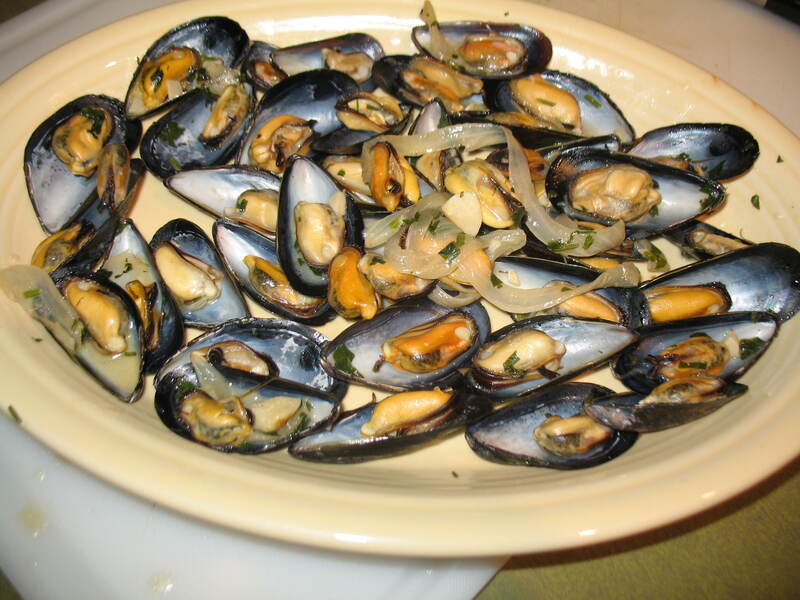 Enjoy and feel like you are in your own Italian grandmother’s kitchen. This needs no introduction. 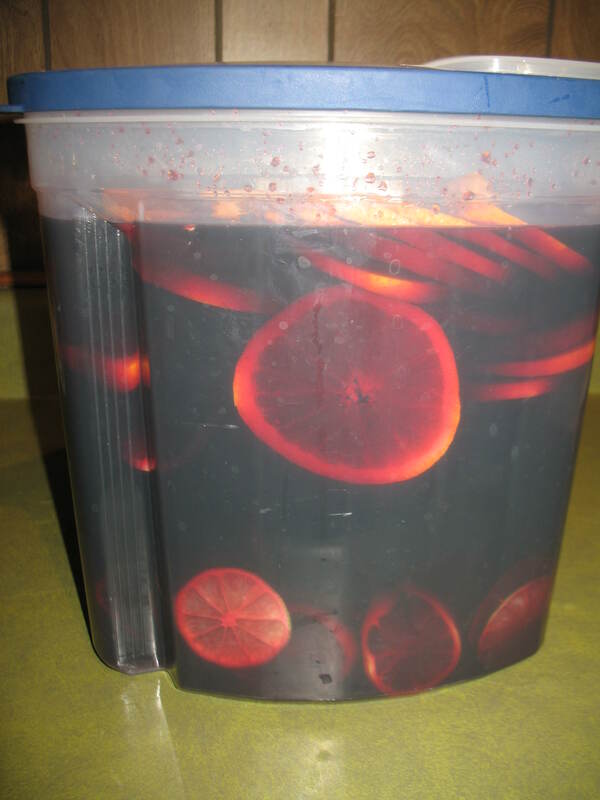 Sangria is awesome, tasty, and easy. There is never a bad time for it. Slice up two navel oranges, three limes, and three lemons. Add to a large pitcher that you are holding for ransom until your awesome friend Mary comes back to claim it. 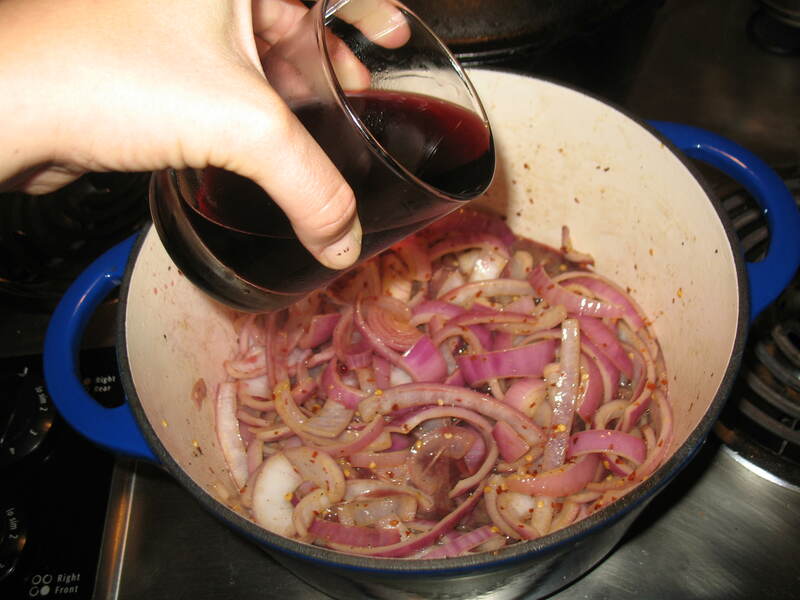 Pour about 3 bottles worth from your box of wine in the fridge. Wait, what? 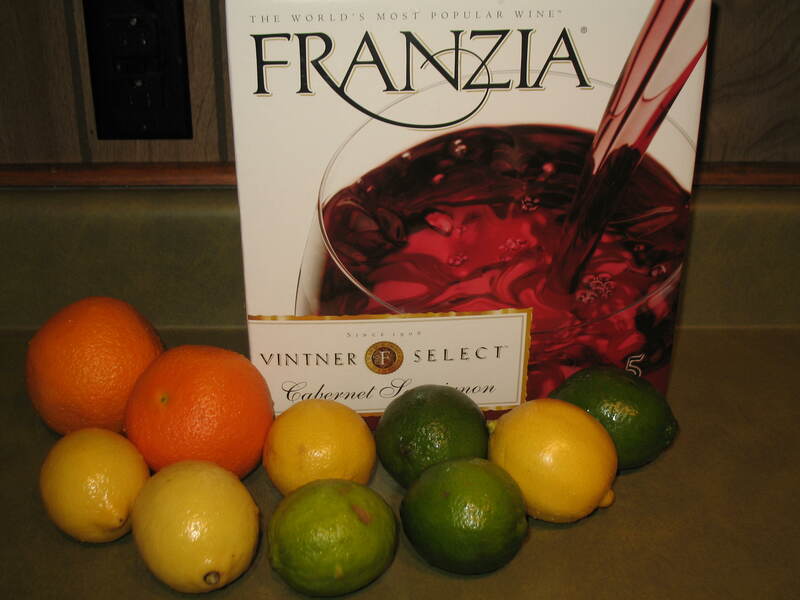 You don’t drink wine from a box? Well then pick your favorite red wine. 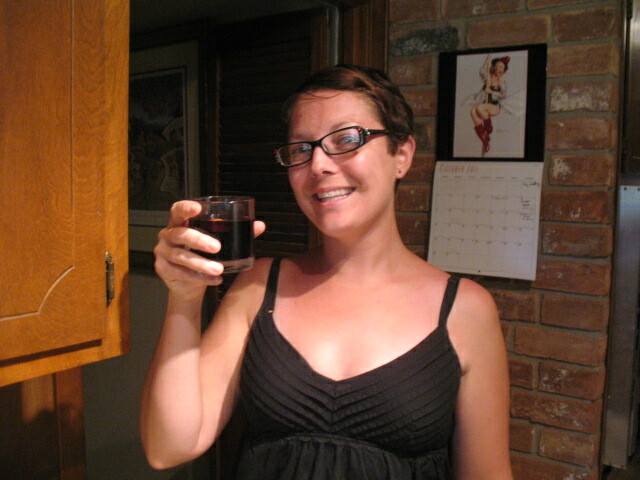 Sweet reds work very well, but I’m not a sweet red kind of gal so I used Cabernet instead. Let it marinate in the fridge over night. Enjoy with friends on a fine Sunday afternoon. I have to give all the credit to the lovely Mary for this recipe. She was the one that brought it over originally. I was sent this message the other day. 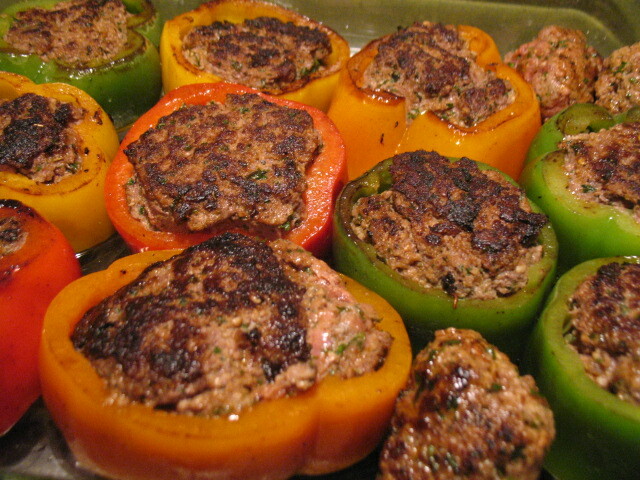 “I have a great recipe for stuffed peppers. 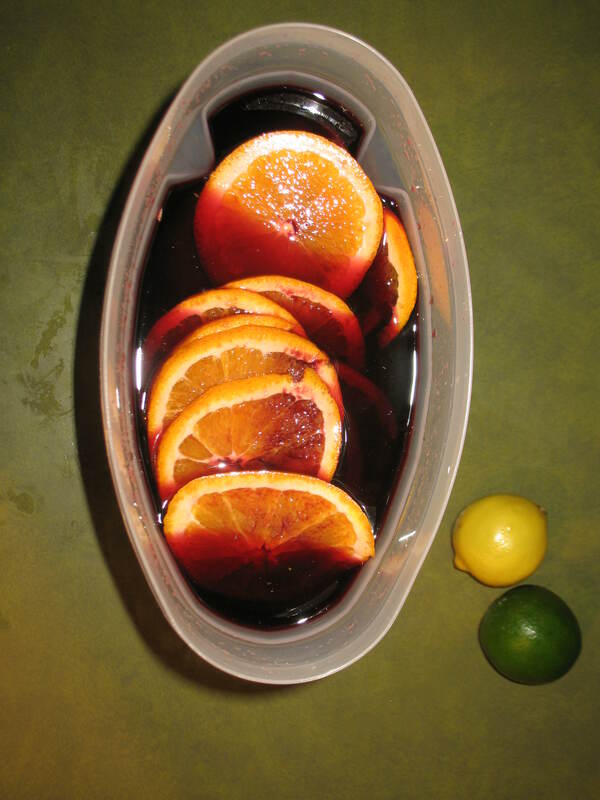 How about we come over and make it at your house and drink sangria?” How in the world do you say no to that proposal? Someone wants to come over make me food and bring tasty wine? Uh why hasn’t this happened sooner? Hehe. Well Mary did come over. She brought delicious food and wine. It was a great time. It felt strange to do nothing but take pictures and drink, but it was worth it! Below is her recipe and a few of my comments. 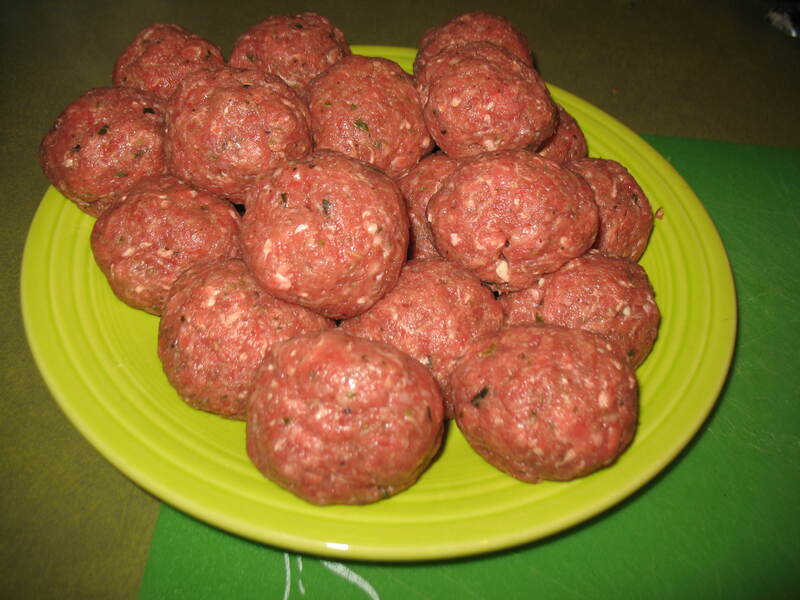 Mix ground beef with half of the garlic, basil and oregano, all of the onion powder, chili powder, parsley, and paprika. 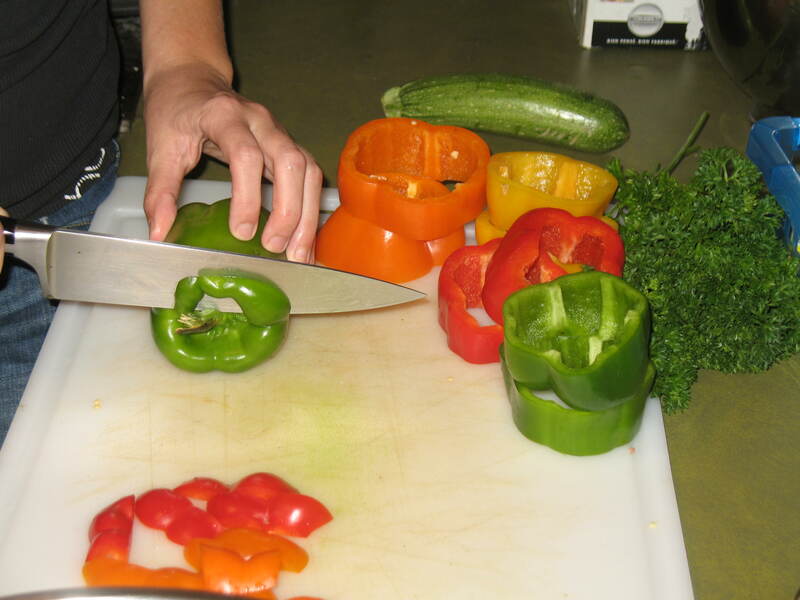 Cut the tops and bottoms off of the bell peppers, strip of seeds and membrane and slice into thick rings. You should get two rings from one large bell pepper. You can cut up the tops and bottoms to saute in with the onion for the sauce, but if my kids are around, I just give it to them. 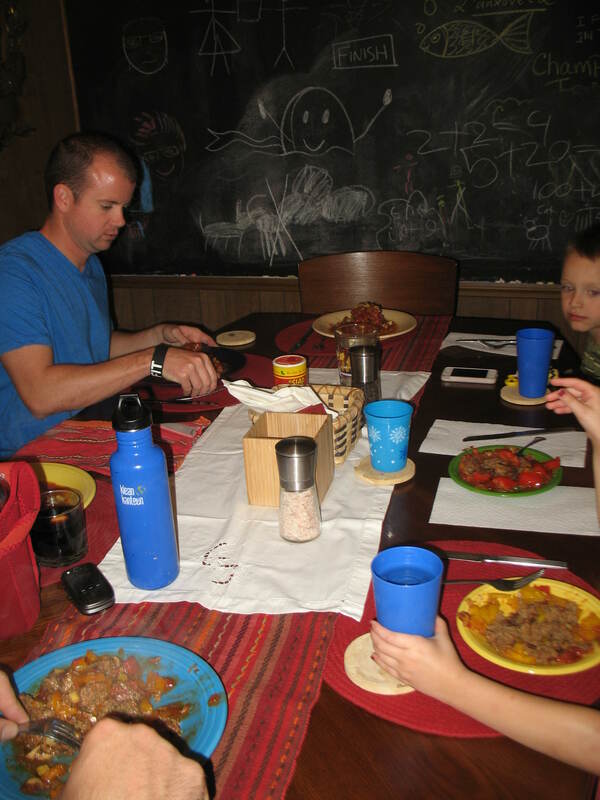 These kids loved veggies! 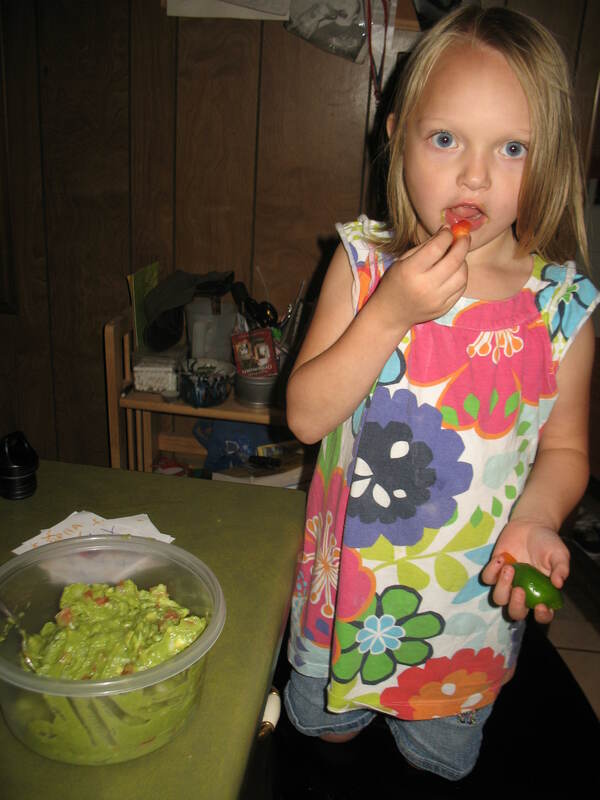 I’ve never seen kids fight over peppers and guacamole. 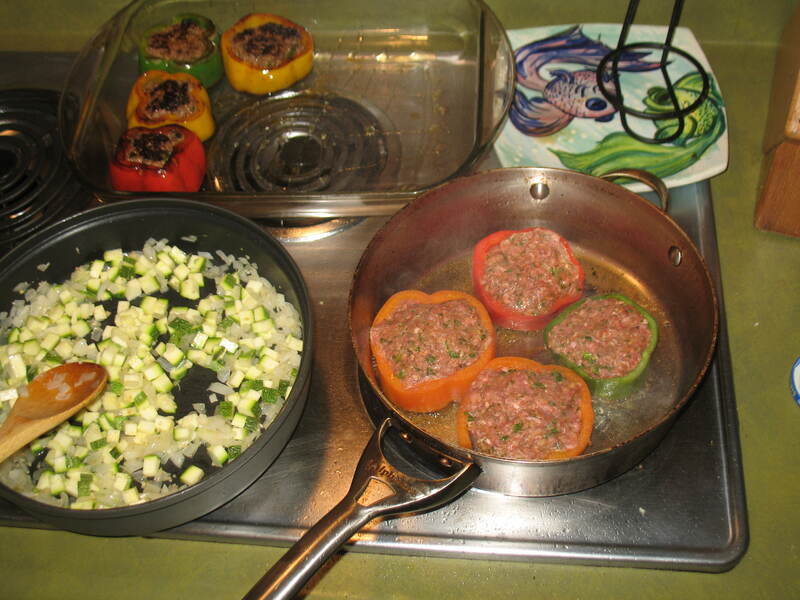 Stuff the meat mixture into the peppers. 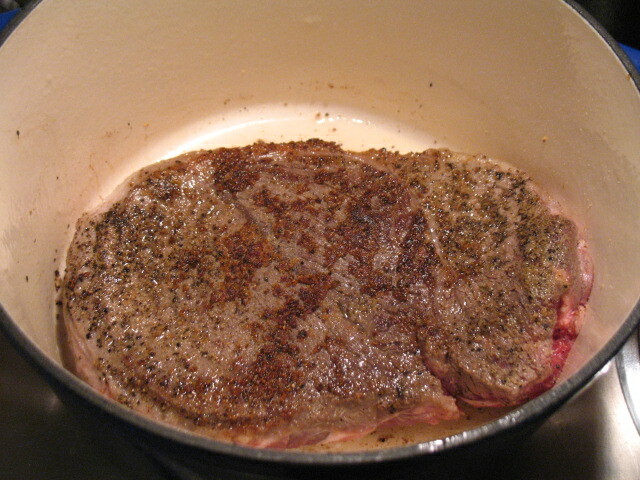 Put in a hot pan with olive oil to sear on both sides, and load into a baking dish. Get them as close to each other as possible. Saute the onion in olive oil until clear. You can use the same pan. Add the zucchini and mushrooms and saute for a few minutes. Mushrooms will be soft and the squash may start to brown a little. 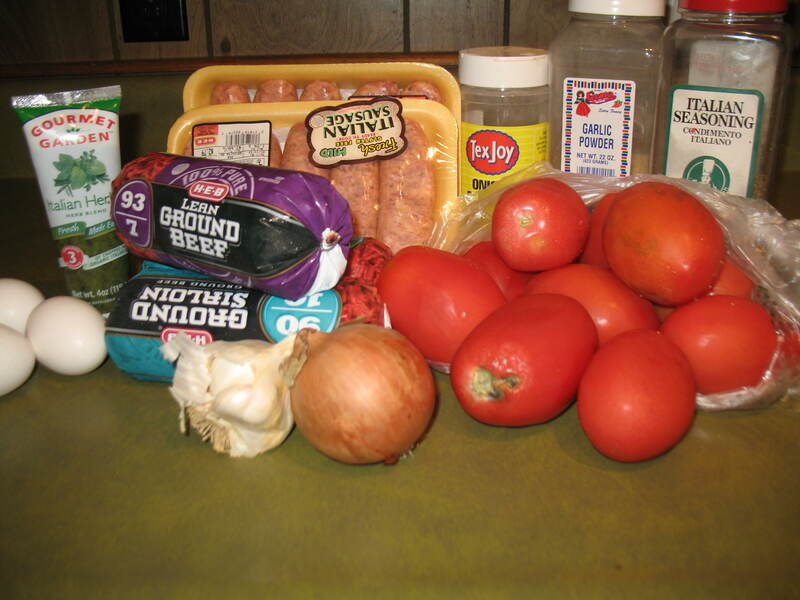 Add the remaining seasoning and tomato products and bring to a boil. 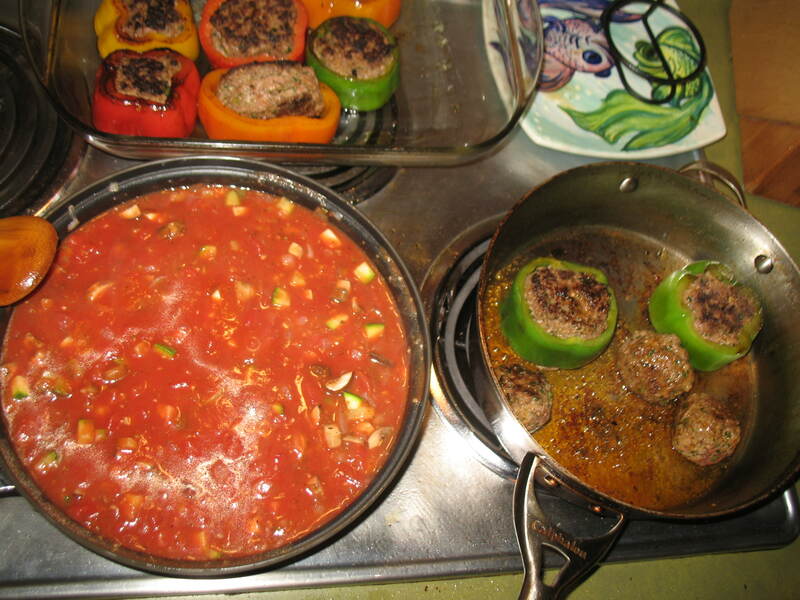 Reduce heat and simmer for a few minutes, pour on top of the peppers, and bake at 425 for about thirty minutes. You should be able to cut the peppers with a fork when they’re done. This was a super tasty meal and so pretty! My local grocery store was running a special deal a few weeks ago. If you bought the enamel cast iron pot you got a roast, salsa, and tortillas for free! I’ve wanted an enamel cast iron for awhile. They are usually really expensive. This is a knock off of the Le Cruset so it was a lot cheaper. This is what I did with the free roast and the pot. I made a post roast. I didn’t write down the recipe because I was busy cleaning and dealing with washing machine repair men. But here are the photos and a general outline of what I did. 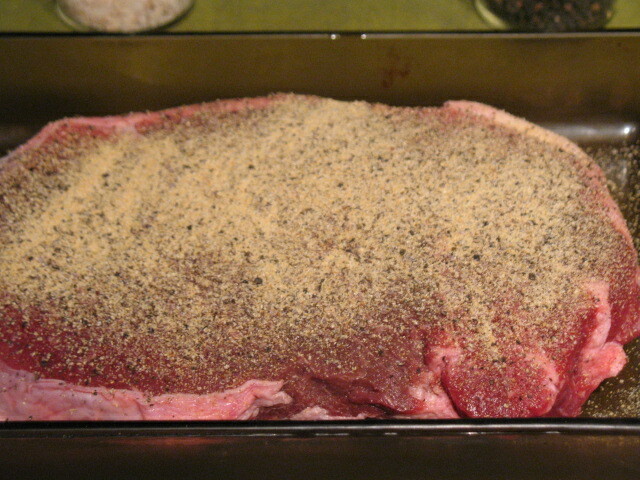 Seasoned the roast with garlic powder, kosher salt and fresh black pepper. Browned the roast in a little fat. 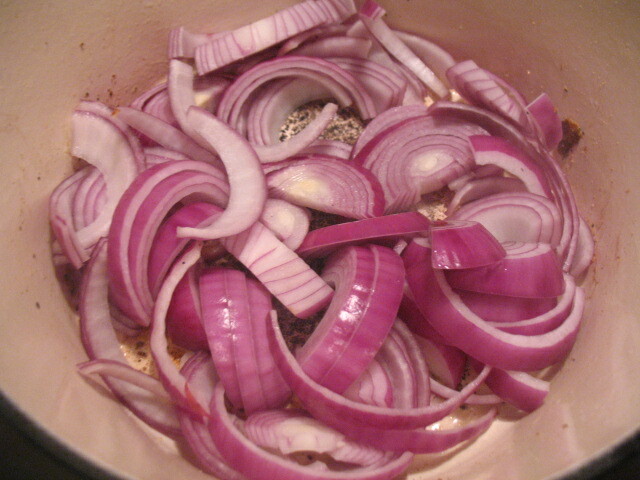 Removed the meat and added two chopped red onions. Cooked them down till starting to get clear. 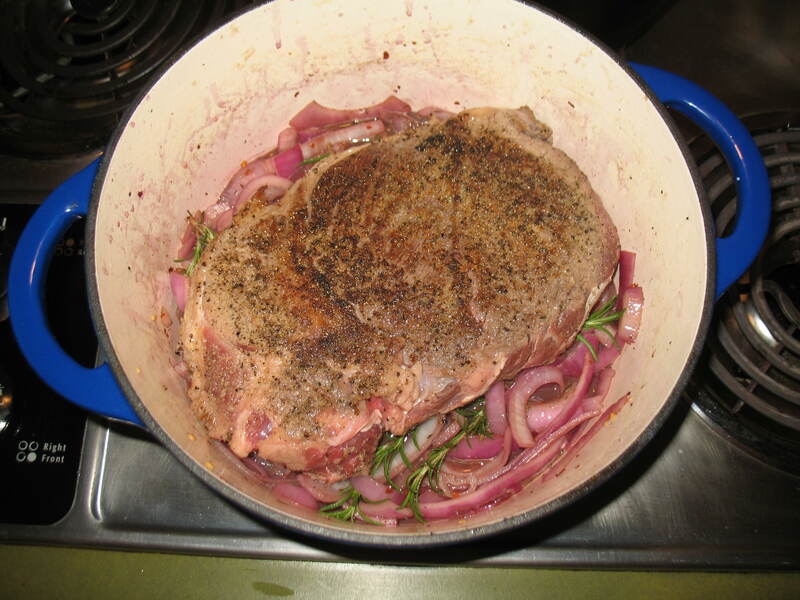 Added about a cup of dry red wine, a can of chicken stock, a few sprigs of fresh rosemary, pinch of thyme, a pinch of mace (spicier version of nutmeg) and the meat. I cooked this in the oven at 300 for about 2 hours covered. 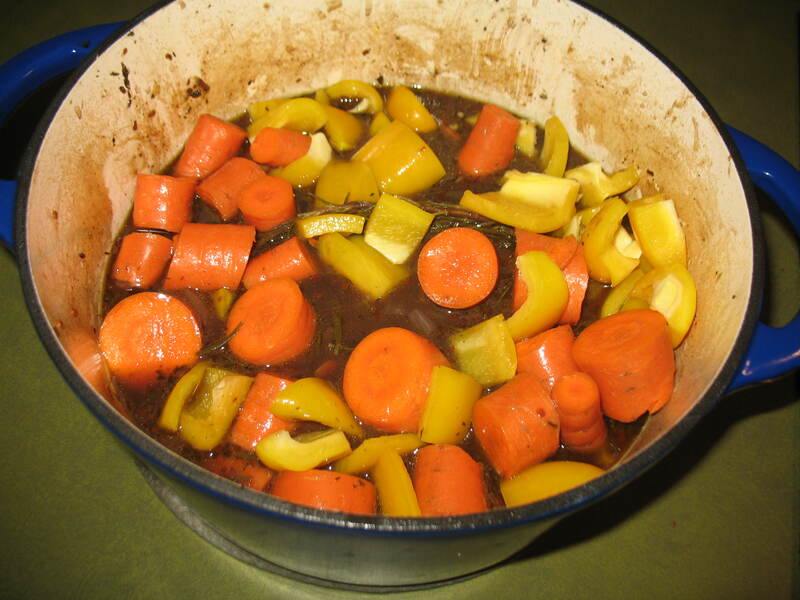 Then added some carrots and yellow bell pepper. then returned it to the oven for another 2 hours but uncovered this time. Then I made gravy from the juice of the roast and a flour butter roux. 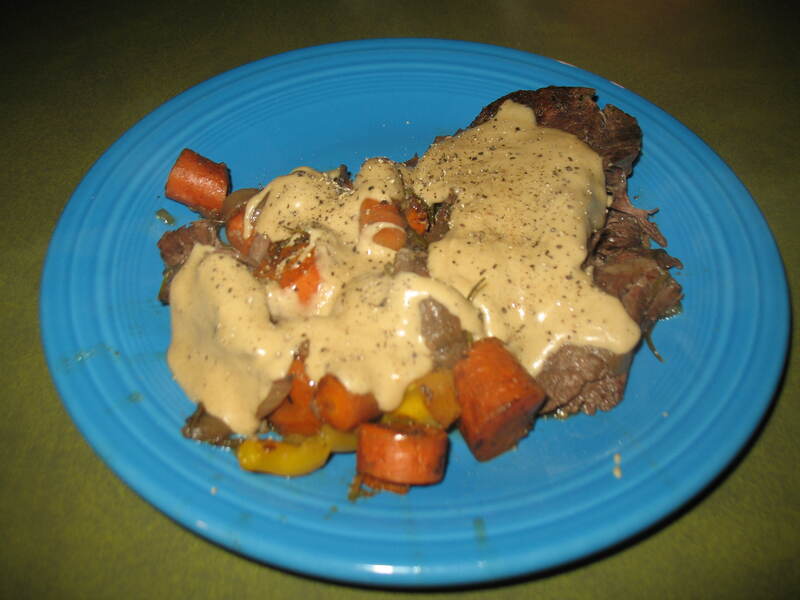 Nothing is more classic than pot roast and gravy. So delicious. 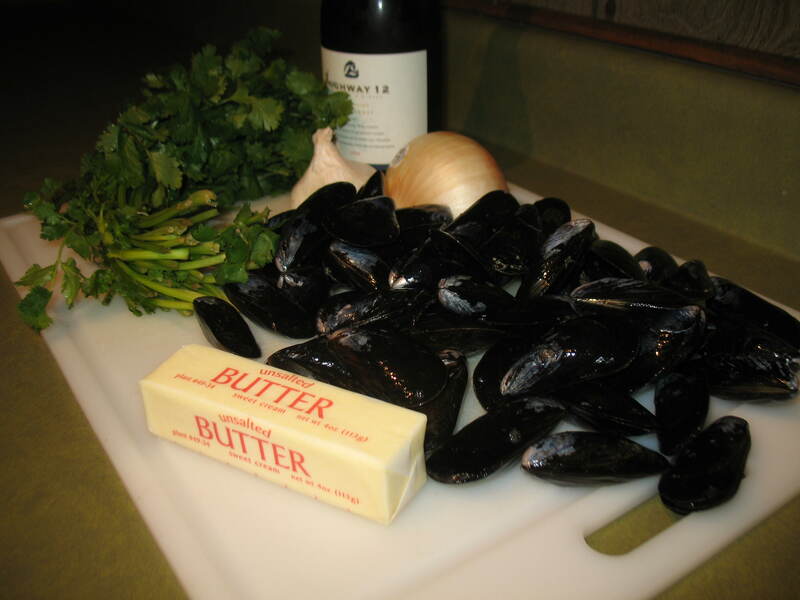 “basics: a sack of mussels, about 2# or so. 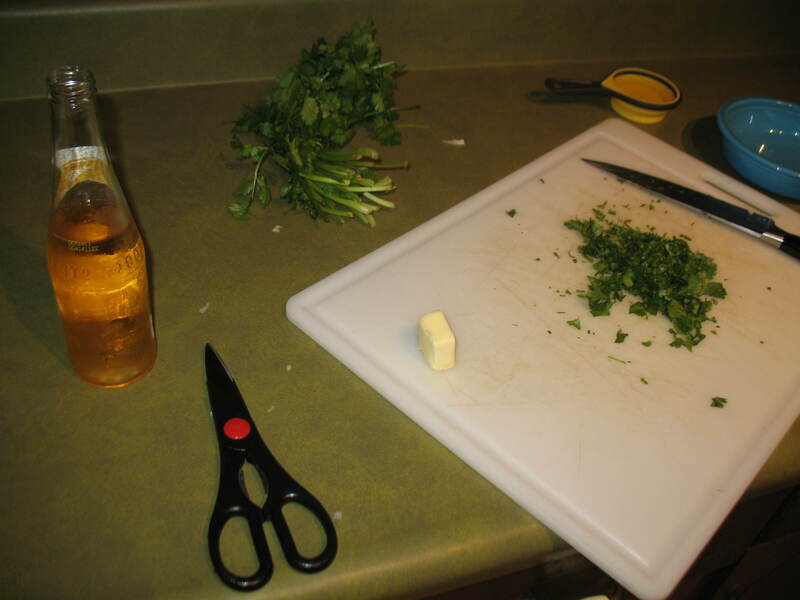 Half an onion chopped, stick of butter, and cilantro roughly chopped as garnish. and wine. always wine. 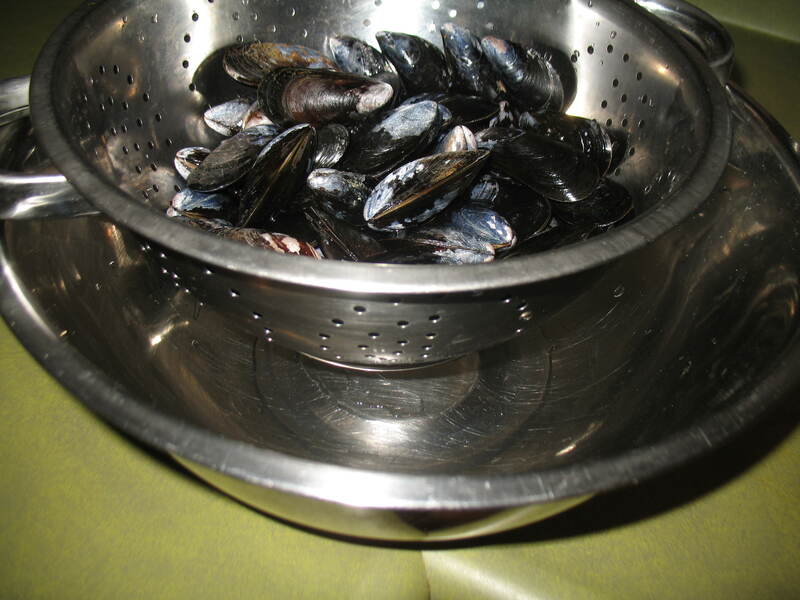 Dump mussels into a colander give a good rinse and discard any that are open. 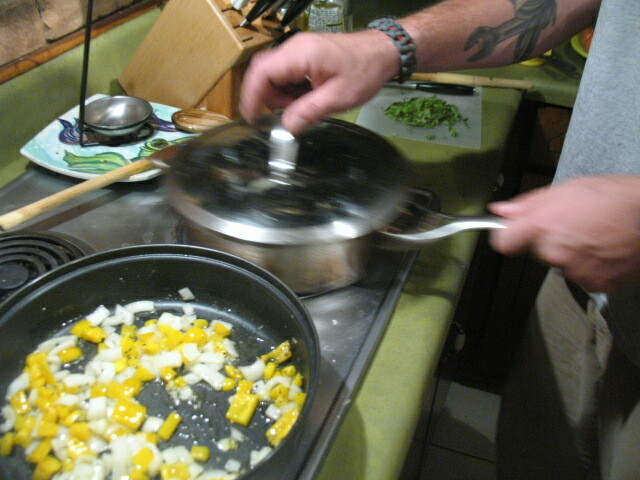 Stirring the onions and butter until they are right. looking for a nice browning of the butter and light caramel of the onions. 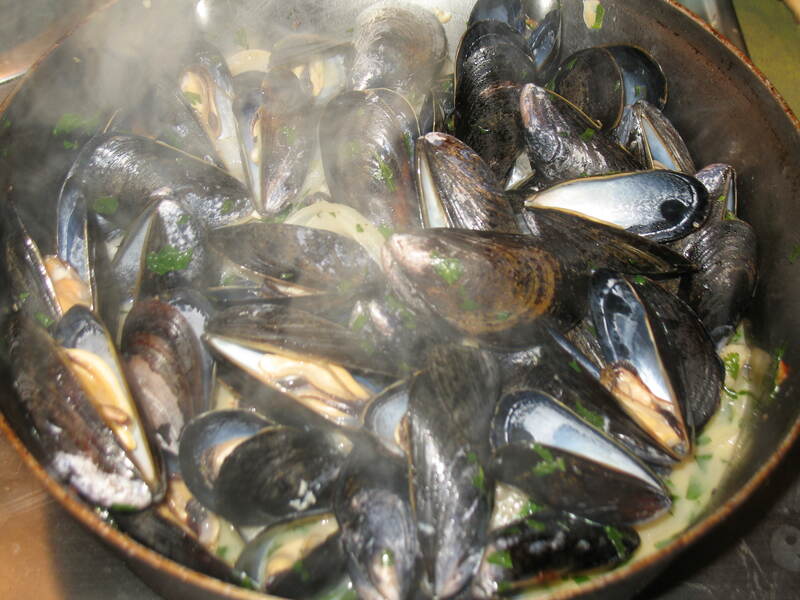 Dump the mussels into butter and onions with about 1/2 cup dry white wine, cover and steam until all are open. 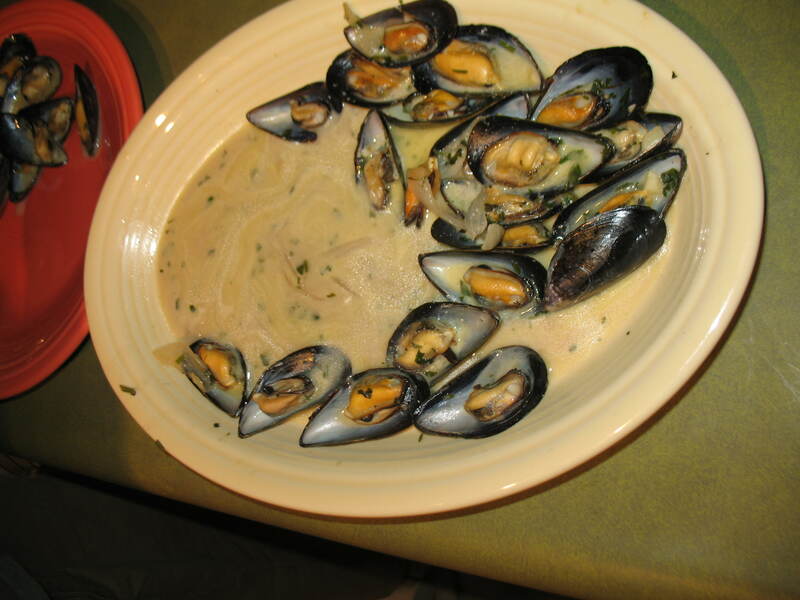 When all are open, halve shells and discard scraps. Strain remaining liquid into a light roux then drizzle on the meat and garnish with cilantro. 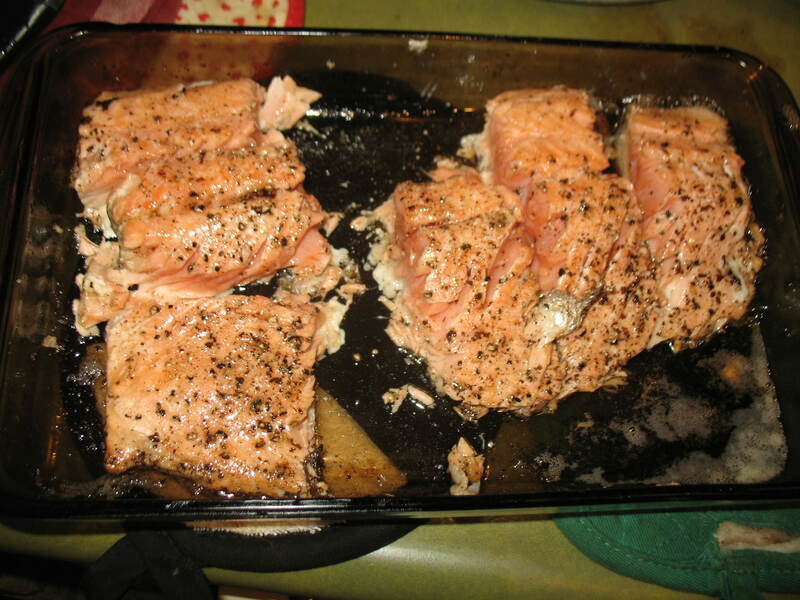 This is Mark Bittman’s “Salmon roasted in butter” and it is one recipe i rarely deviate from how it was written. Good work Mr. Bittman. 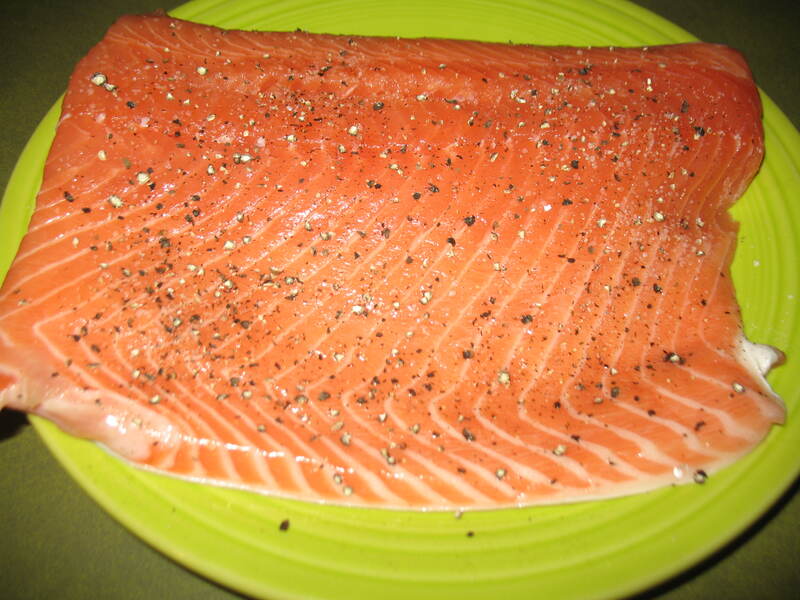 Take a nice skin on fillet of salmon, ~2-3# and liberally spice with fresh cracked salt and pepper. In an oven safe dish brown about 1/2 stick of butter at 475 until the foam settles down then place the salmon, skin side down, in butter and roast about ten minutes turning occasionally. The way i like to gauge the doneness of fish is by inserting a metal skewer into the meat for a moment then placing the bare skewer on my lip a time or two until the metal is warm to the touch. This was about 10 minutes or so for this particular cut of fish. I also make it a point to buy whatever i am going to cook the day i am going to cook it, usually on the way home to cook it. Fresh is key. When the meat is done, simply remove it from the pan and serve as is. the skin is delicious but easy to separate if not to a particular taste. So there we have it. 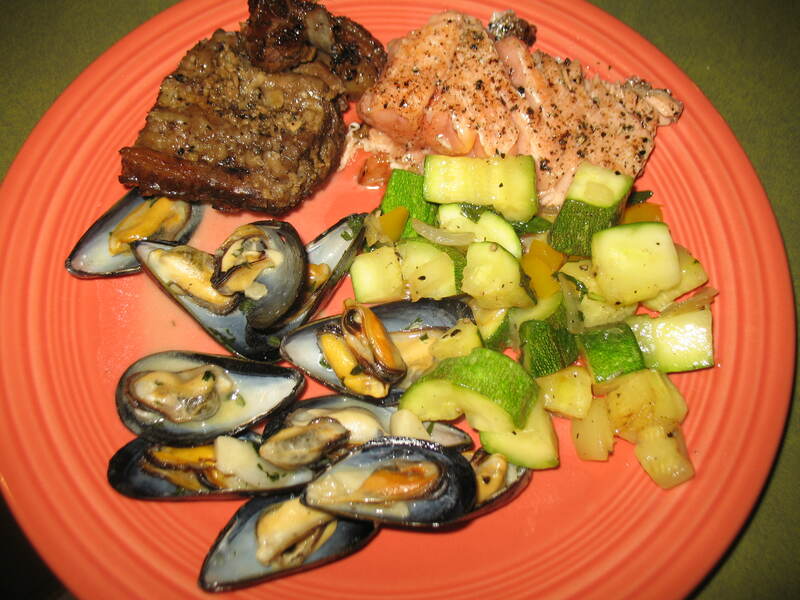 Fish and mussels for me, Asian style ribs for her, and zucchini for the both of us. 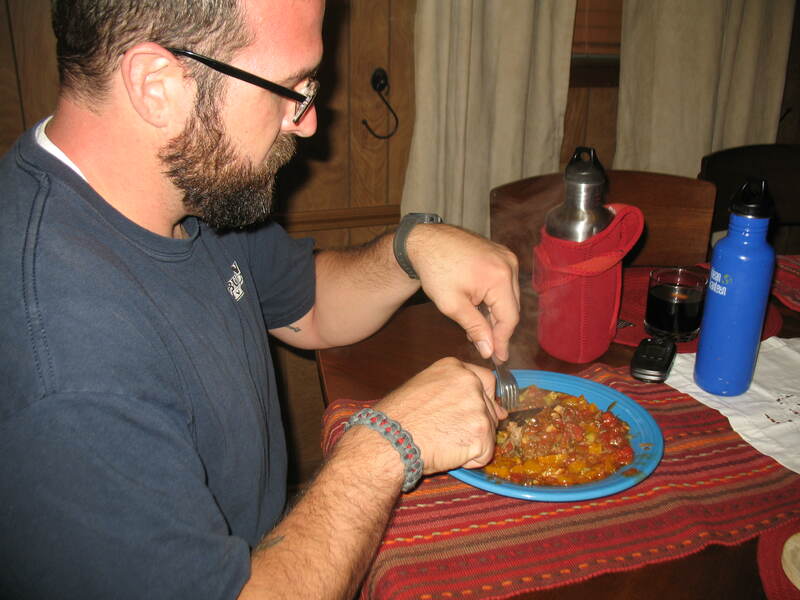 I hope you enjoy T’s fish meal!